Palm Kernel Butter - Dr. Jane Bokström G-B-S, developed by SIRM, Uppsala, Sweden brings PKB directly to consumers. 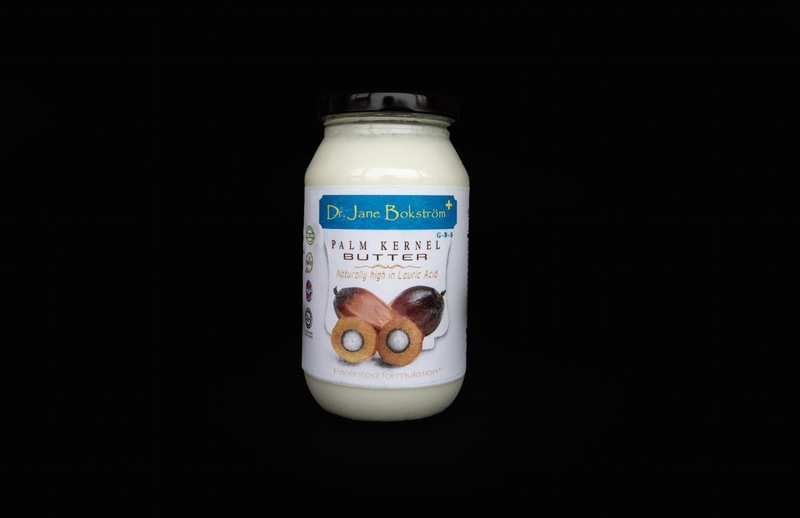 The main ingredient in PKB is from palm kernel oil. This oil is widely used in high-end confectionary for e.g. cookies, ice cream, baby food etc. Palm oil has a recorded use in food preparation dating back 5000 years. 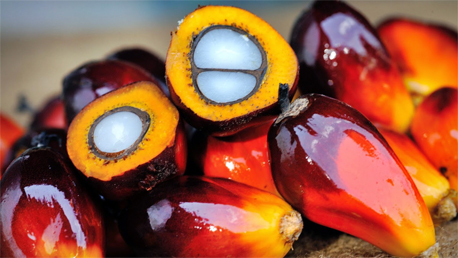 PKB is from the seed (endocarp) whereas palm oil is from the fruit (mesocarp). PKB is composed mainly of saturated fat and naturally rich in lauric acid and myristic acid. Due to its favorable fatty acid composition, PKB is marked for its pro-health and anti-aging properties. PKB has similar chemical properties as virgin coconut oil (VCO). Both are composed of predominantly saturated fats. PKB has high amounts of medium chain triglycerides (MCT) and a naturally very high amount of lauric acid. The level of lauric acid is approximately 48%, depending on the time of harvest. PKB differs from VCO and also has an edge because of its higher amount of monounsaturated fats. This balanced composition within PKB has shown to lower chronic inflammation further and also helps shed excess fat through the action of adiponectin. MCT are not stored as adipose fat initially but used as fuel instead. Ketone bodies formed from MCT are the preferred fuel for brain and muscles. 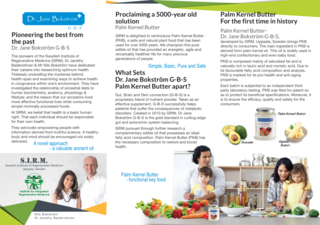 People with various health issues have used Dr. Jane Bokström G-B-S’ Palm Kernel Butter with guided protocols. Reports and testimonies indicated that a significant drop in the % of fat was observed within weeks among those with a high percentage of subcutaneous and visceral fat. Feedback and tests confirmed improvements in the inflammatory bio-markers, significant relief from joint pains, and in some cases the pain was totally gone. Even before-after results of hormonal, lipid and thyroid level profiles showed positive improvements. 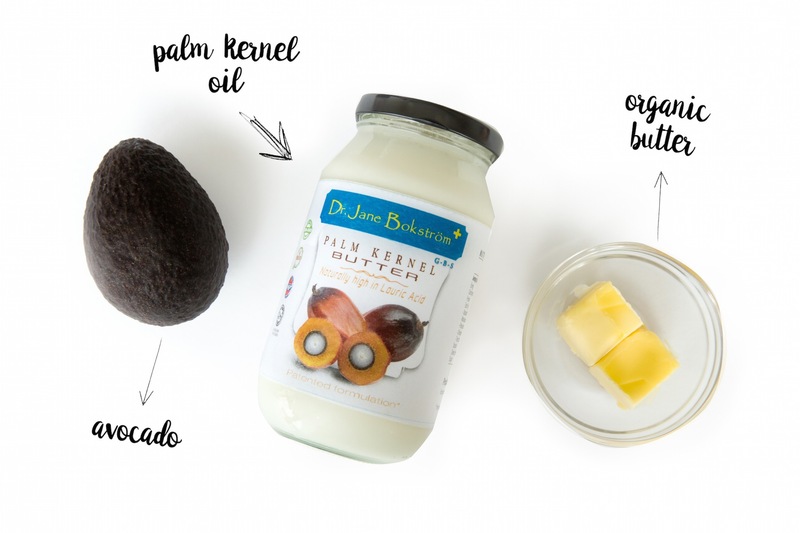 Testimonials also confirmed that Dr. Jane Bokström G-B-S' Palm Kernel Butter helped raise users' energy levels and improve their perceived cognitive functions. These results and changes were observed from the diagnosis of their body composition, blood tests and other related diagnostic tools. A simple testimony is that patients experienced a heightened self-esteem and confidence. They also feel flattered with a better self-image. The gut is often referred to as the second brain because it shares the important neurotransmitters that govern the satiety centre, emotions, instincts and other vital functions. The gut is connected to the brain via the vagus nerve. The healthier the gut, the better the absorption and utilization of vital nutrients in the body. Hence, physical and mental health indirectly starts from the gut. Since the gut, brain and skin are derived from the same embryonic layer, they share many neural pathways and hormonal signalling systems. That internal health is manifested externally on our skin and vice versa. The gut and skin host an array of microbiome that determine our gene expressions as found in epigenetics. That's why although our genes are important in determining our health, the reaction of our G-B-S to environmental factors and the vibrations around us, are equally if not more important. Simply put, our DNA loads the gun, but it's the environment that pulls the trigger. They protect against harmful microorganisms in our digestive tract. They help our body absorb healthy nutrients form the food we eat, especially Vitamin A, D, E and K.
They enhance our immune system. They facilitate the bioavailability of our youthful hormones. They help to restore sub-clinical hypothyroid in aging. They are needed for the proper utilization of essential fatty acids. They facilitate the conversion of Omega 3 to DHA. Males have a poorer conversion to Omega 3. They lower Lp(a), a substance in our blood that indicates proneness to heart disease. They play a vital role in the health of our bones. For calcium to be effectively incorporated into our skeletal structure, at least 50 percent of our dietary fats should be saturated. They protect our liver from further damage due to alcohol, toxins plus other pharmaceutical drugs. They help to treat fatty liver when incorporated with a low carbohydrate diet. Saturated fatty acids constitute at least 50 percent of our cell membranes. They are responsible for giving our cells necessary stiffness and integrity. 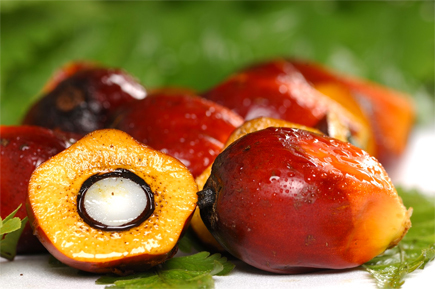 Palm olein (from the flesh of the palm fruit) and palm kernel oil (PKO, from the kernel of the palm fruit) have been widely used for human consumption for more than 5000 years. However, during the last 50 years, anti-palm oil lobbyists have put these oils in the backyard of healthy products. We all know that these oils are widely used in food and cosmetic productions but rarely is it clearly displayed as what it truly is. Surprisingly, its health properties are never mentioned or displayed. The reason is the fact that its benefits have been overlooked for centuries! We believe that the time to change this, is now! PKB has value added benefits for topical applications and hair as in personal care products. PKB absorbs well into the skin without feeling greasy and is fantastic for damaged hair. Many users have also expressed great satisfaction after using PKB as a carrier oil with therapeutic grade essential oils. Dr. Jane Bokström G-B-S shares the philosophy that “whatever we apply on our skin has to be safe enough to be eaten”. •	PKB is an oil that solidifies at various room temperature, approximately 25 degrees Celsius. •	Because of PKB’s neutral taste and smell, it is easily incorporated into any food. 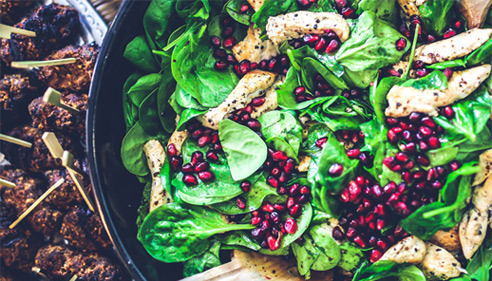 PKB has shown to enhance the natural flavour, aroma and texture of the food when it is added. •	PKB can be directly consumed raw or added to any dish as a condiment. •	PKB has a delicious creamy texture when added to hot beverages, yoghurt, smoothies, sauces and creams. •	PKB is also great for cooking, deep-frying, baking and grilling. It has one of the best stability profiles at prolonged high cooking temperature as it was tested favourable to maintain its beneficial characteristics. •	PKB also has a very long stable shelf life compared to other oils. N.B. : Dosage should be tailored for relevant indications.